On 23 September 1969, USS COLLETT (DD-730), in company with USS BLUE (DD-744) and USS DEHAVEN (DD-727), departed for a six-month deployment with the Seventh Fleet. The first stop was Pearl Harbor for five days. On departure, COLLETT joined USS CORAL SEA (CVA-43)and participated in her operational readiness inspection (ORI). Completing two days of local operations, the carrier task group, including BLUE and DEHAVEN, departed for the Far East. COLLETT made a brief two-day visit to Yokosuka, Japan, and then proceeded to Subic Bay, P.I., arriving on 22 October. The ship got underway for two days of local gunnery exercises on 24 October and then proceeded to the Tonkin Gulf late on the 26th. COLLETT arrived on Yankee Station with CORAL SEA and BLUE on 27 October. For the next ten days, time was divided between plane guarding for the carrier and riding “shotgun” for USS GREENLET (ASR-10), while conducting salvage operations. On 7 November, COLLETT was directed to proceed to Search and Rescue (SAR) station where she joined USS LONG BEACH (CGN-9), and served as “shotgun” destroyer until 14 November. The ship then departed for Kaoshung, Taiwan, arriving of 16 November for a four-day visit. On 21 November, COLLETT again joined CORAL SEA and traveled in company to Sasebo, Japan, arriving on the 23rd of November. After ten days in Sasebo, the ship departed in company with USS CORAL SEA, USS HOEL (DDG-13), USS BLUE, USS DEHAVEN, and USS O’BRIEN (DD-725) for operations off the coast of Okinawa. For five days the ship participated in various operations, which included two full days of anti-submarine warfare, COLLETT then made a fuel stop at Buckner Bay, Okinawa, and returned to Sasebo. After one day in port, the task group departed for three days of operations in the Sea of Japan, returning to Sasebo on 12 December. After a one-week upkeep period alongside USS AJAX (AR-6) the ship departed for the Tonkin Gulf with CORAL SEA, BLUE, and DEHAVEN, arriving on station the 21st of December. Christmas Day on Yankee Station included 12 hours of plane guarding, 4 helicopter transfers for Chaplains providing Divine Services on board, and a fuel replenishments from USS KAWISHIWI (AO-148). On 30 December COLLETT began ten days of operations as “shotgun” destroyer for USS JOUETT (DLG-29) on “Piraz” Station representing our northern most naval units in the Tonkin Gulf. The ship then resumed plane guarding with CORAL SEA for a week and departed Yankee Station to arrive in Subic Bay, P.I., on 20 January. After a four-day upkeep period, COLLETT headed for a welcome six days of Rest and Recreation in Hong Kong, R.C.C. While there, the ship sponsored a party for more than thirty Chinese orphans, while twenty-five of COLLETT’s crewmembers donated blood to the Red Cross. COLLETT became flagship for Commander Destroyer Squadron NINE on 1 February. 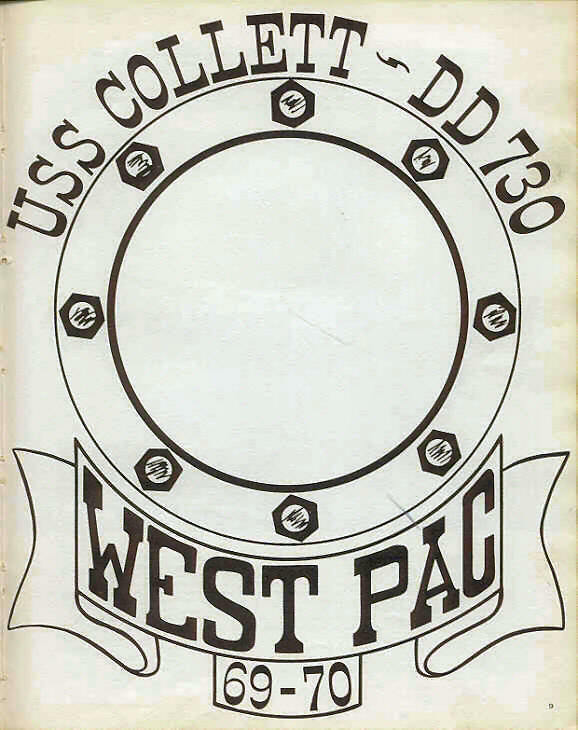 After Hong Kong, COLLETT was to return to Yankee Station via four days in Subic Bay. However, due to operational requirements, she proceeded directly to Yankee Station to plane guard for the USS HANCOCK (CVA-19). On 8 February, while plane guarding for HANCOCK, a Navy SH3-A helicopter crashed into the water as it made its approach on the carrier’s flight deck. In six short minutes, COLLETT’s motor whaleboat was alongside and rescued the seven survivors. COLLETT’s reaction to the emergency indicated that each member of the crew did an exceptional job. On 10 February, COLLETT became a member of the Naval Gunfire Support (NGFS) team along the coast of the Republic of Vietnam. At the same time, Commander Destroyer Squadron NINE became Commander of all ships participating in NGFS missions. Anchoring in Danang Harbor for her first night’s work, COLLETT began two weeks in which her six guns pounded enemy targets. The most significant period was the four days spent in support of the first ARVN Armored Brigade where COLLETT provided tremendous firepower in support of operation “Dung Son 3/70” 20 miles south of Danang. COLLETT’s timely an accurate fire were responsible for the complete disruption of a large area which had been an impenetrable enemy stronghold. The operation was highlighted when the Commanding Officer of the First Brigade made a personal visit to the ship to express his gratitude for COLLETT’s support. COLLETT’s efforts aided an invaluable operation which was a large step in the “Vietnamization” of the war in the I Corps area. On 27 February, the ship arrived in Subic Bay to complete final preparation for the 7200-mile journey home. COMDESRON NINE departed COLLETT on 4 March to embark in USS BLUE (DD-744). Upon her arrival in Long Beach this veteran destroyer of three wars will have steamed 43,000 miles, spent 140 of her 180 days deployed at sea, and met every operation commitment required of her. She has conducted 32 underway replenishments, which have been the source of the 2,000,000 gallons of fuel consumed. Over 170,000 meals have been served and 3800 rounds of 5 inch 38 caliber ammunition have been expended in support of American and Vietnamese forces. In Long Beach, COLLETT’s seven new fathers will meet the new additions to their families for the first time. Ten members of the crew plan marriage shortly after the ship’s return.